Flavor boosters: green chilis, jalepeños, more garlic, and other seasonings. Make extra! Leftovers make a great filling for tacos, burritos, filling for stuffed bell peppers, or as a topping for baked potatoes. Use whole grains! Use brown rice instead of white rice and increase cooking time to 45 minutes or until rice is cooked. Cook ground beef, onion, and green pepper in large skillet over medium heat (300 degrees in an electric skillet) until hamburger is no longer pink. Drain excess fat from pan. 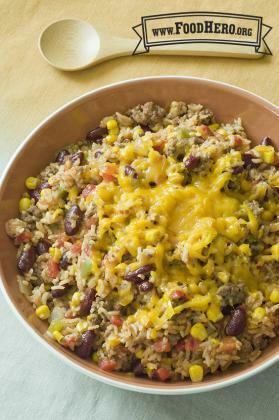 Add water, rice, garlic powder, chili powder, salt, pepper, tomatoes with juice, corn, and beans. Cook, covered, for about 20 minutes or until rice is soft. Remove from stove top, sprinkle with grated cheese, and serve hot. 7 Comments for "Tasty Hamburger Skillet"
This recipe is perfect for my family. We like to serve this with a green salad with diced apples. Then we are eating all 5 food groups! Are we supposed to cook on medium? I had it simmering and the rice didn't even cook. I changed the heat to medium so we shall see. Thanks. Simmering should be the correct temperature for cooking rice. Use whatever setting on your stove that will keep the liquid simmering but not boiling. It is also important to put a lid on the pan. If too much liquid evaporates before the rice is tender, add a small amount of water and continue cooking. I would suggest this as a burrito filling. That is a great idea Claudia, thank you for sharing! See the note we added above. Makes a really great meal. We used sour cream and it really made a difference!